포스두이구아수에 위치한 Tarobá Hotel은 새 공원(Birds Park)에서 14km 거리에 있으며, 에어컨이 완비된 객실을 자랑합니다. 숙소 전역에서 무료 Wi-Fi를 이용하실 수 있습니다. 연중무휴 야외 수영장, 어린이 놀이터, 일광욕용 테라스가 자리해 있으며, 투숙객들이 음료를 즐길 수 있는 바도 마련되어 있습니다. 구내 전용 주차장을 무료로 이용하실 수 있습니다. 객실은 에어컨, 평면 케이블 TV, 미니바를 갖추고 있습니다. 전용 욕실에는 헤어드라이어가 비치되어 있습니다. 24시간 프런트 데스크, 피트니스 센터, 기념품점도 마련되어 있습니다. 호텔에서 탁구를 즐겨 보십시오. 이 호텔은 렌터카 서비스를 제공합니다. 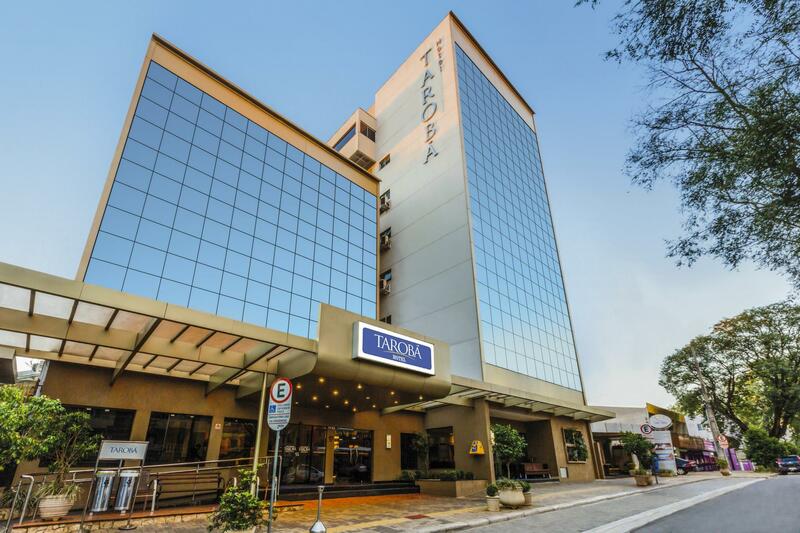 Tarobá Hotel에서 이구아수 폭포 및 이구아수 국립공원은 각각 22km 거리에 있습니다. 가장 가까운 공항인 포스두이구아수/카타라타스 국제공항은 Tarobá Hotel에서 12km 떨어져 있습니다. 모든 투숙객은 신분 확인을 위해 사진이 부착된 유효한 신분증을 제시하셔야 합니다. 브라질 연방법 8.069/1990에 따라, 18세 미만의 미성년자는 부모 또는 지정된 법적 보호자와 동반 시에만 호텔에 체크인하실 수 있습니다. 미성년자가 부모 이외의 성인을 동반하는 경우 해당 미성년자의 호텔 체크인을 허락하는 서면 동의서를 제시하셔야 합니다. 이 동의서는 양쪽 부모님이 서명한 후 공증 절차를 거쳐야 하며, 부모님의 공증 받은 신분증 사본을 첨부해야 합니다. 예약 후 총 예약 요금에 대해 신용카드로 사전 승인이 이루어집니다. 결제는 체크인 시에 진행되어야 합니다. 투숙객이 본인의 국가 통화로 결제하기를 원한다면 호텔의 당일 환율을 확인하셔야 합니다. 본 호텔은 10%의 서비스 요금 및 1인 기준 일일 투어 요금을 청구합니다. 해당 요금은 의무적이지 않습니다. 주차장이 협소한 관계로 이용 가능한 경우에 한해 주차 공간이 제공됩니다. 단체 예약(객실 5개 이상)의 경우, 별도의 정책이 적용됩니다. 자세한 사항은 숙소로 문의하시기 바랍니다. My family of two adults and two very sleepy children arrived at about 11pm after 12 hours travelling from Argentina. The desk staff at the Best Western advised us that they had sold our pre-paid room to someone else and that we needed to travel to another hotel across town. This came after we had unpacked and brought in all our luggage. They had made no effort to contact us an warn us that there was no room or that we would need to stay at another hotel. The security of knowing we had a room booked was the key reason we booked months in advance and it was incredibly disappointing to find ourselves shuffling between hotels at midnight with a lot of bags and two very tired children. They sent us to another hotel which was fine but to make matters worse It took half of the next morning to negotiate not having to pack up and transfer back to the Best Western (impractical between falls trips and managing naps for young children) or to have to pay a price difference for the new hotel (including for the first night that we didn't even want to be there!). As we were only in Iguazu for 2 days and 3 nights we wasted more than a quarter of our time there dealing with the basic failure of this hotel to provide us a room. Put simply: if you expect to actually have a room waiting for you when you pay in advance for it try somewhere else. location, friendly and helpful staff, very good breakfast. I had a good stay and my first time to Brazil. Very helpful people no language problem in the hotel. Very good travel desk for tours. The best thing is close to the main bus terminal. I had a room in the old tower but it was okey. can arrange transport, trips and dining options all at once. Quite good. I liked how everything can be booked downstairs. As long as you dont mind spending a bit more money than those who did research, this hotel is very handy. I recommend those who are after comfort to stay here. Great spot to stay when visiting the falls. two blocks to the bus terminal (about a 35 minute ride to the airport or the falls). Clean rooms. The pool is very small and when 3 or 4 people get in it starts to feel quite crowded. Breakfast was every good! Good location, good hotel, good service. The hotel still has to improve on organizing their check in/out system; twice people knocked on our door thinking it was empty. Tower 1 is the old hotel; tower 2 is the new hotel and that is where you want to stay. The pool upstairs is tiny and chairs are limited. Great breakfast; decent room service (food, etc). Our room was new and so it's the lobby and everything in the first floor. Upon checking out there were incorrect additions to our bill but it was a minor thing. Also, when paying the bill just say you don't want to pay the tourist fee, which comes included in the final bill. The hotel has a tour agency in the lobby that can arrange tours, entrance tickets, etc. The hotel is located a few blocks from the main bus terminal, which is a plus if you don't have a car, which you really don't need. A nice hotel experience at a favorable price - thou some noise during daytime due to major reconstruction of the hotel. I secured a discounted price via agoda.com however when I arrived they tried to charge me more. I had a long argument with the management and we arrived at a compromise. However on they day of checkout they again treid to charge me extra. very frustrating and I would not recommend this place. The room is very very small, very very basic, more like a hostel. Definitely not staying there again. I am not sure if it's because the main building is undergoing construction, and what left in the old buildings are these tiny rooms. I and My wife Was loved this hotel. It is The renew and The room is Very good for your price. Nice room, even if not the newest one, very clean. Very polite staff. Good breakfast, but this kind of breakfast is expected in Brazil. Very convenient location for the bus terminal. Few restaurants around but I have not used them.